When I married my husband over 32 years ago, I began buying t-shirts and/or sweatshirts as mementos of our travels. Fifteen years later, I was overwhelmed with too many of both. So I switched to fridge magnets. Not only was this more challenging (to find THE perfect trinket/magnet for posterity), but, obviously, significantly cheaper. We have two and a half refrigerators. One is in our kitchen—like you thought it might be in our bedroom. One—a very plain one (no bells and/or whistles! )—is in my pantry/utility/laundry room. And we have a “baby” fridge in our Barn apartment. I’m not allowed to display anything on our kitchen fridge. My husband made this rule when we built our home. Probably because it can get out of hand (see picture—this is approximately one-eighth of the area covered in “art" on my utility room fridge). I see my favorite magnets every day—sometimes six to eight times a day—as the utility fridge is mostly filled with water and drinks. 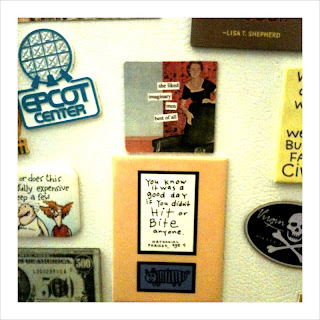 I can tell a story about each magnet, sometimes get kind of teary. Or I can stand there for a few brief moments, contemplating the messages that tickle or inspire me. Please do NOT touch the top of appliance—IMPORTANT dust-settling measurement in progress. That pretty much sums up my housekeeping abilities. With the time and energy we’ve spent dieting we COULD have built a small FAT-LOVING CIVILIZATION. Such amazing wisdom at age FOUR. Wow. Fridge Philosophy---Part Two? Coming soon. I know you’ll be waiting with great anticipation. ta-ta for now . . .
p.s.—PLEASE don’t hit or bite anyone.